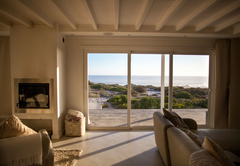 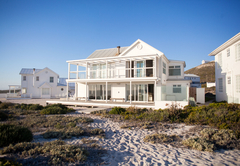 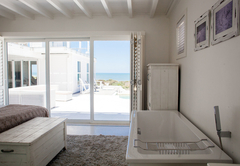 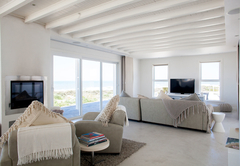 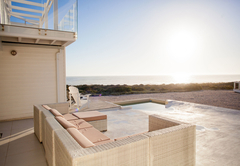 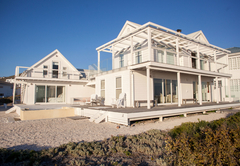 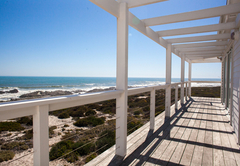 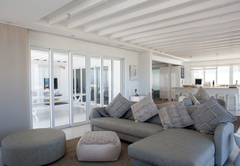 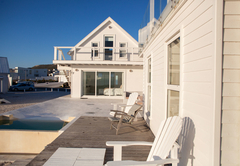 White Sands is a property providing self catering in Yzerfontein for up to 12 guests visiting the Cape West Coast region. 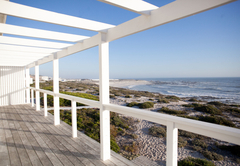 White Sands offers accommodation in a beautiful house in Yzerfontein on the Cape West Coast, only an hours drive out of Cape town. 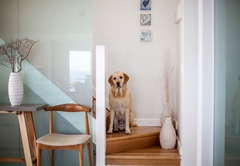 The house is just metres from the sea and is ideal for a family break away. 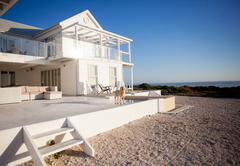 The self catering house has five bedrooms. 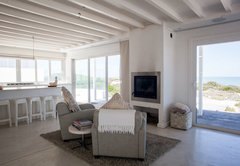 The large main bedroom has a King-size bed, wooden floors, a private lounge with TV, a deck overlooking the sea and an open bathroom. 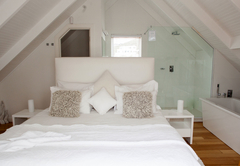 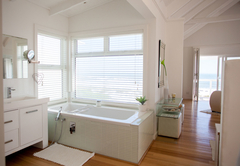 The second and third bedrooms are also furnished with a King-size bed and have a full en-suite bathroom. 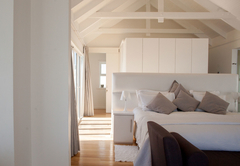 A smaller fourth bedroom has two double bunk beds as well as two extra pull out beds, making it ideal for the kids and their friends. 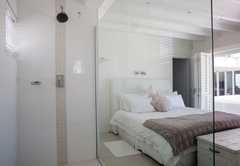 This room shares a full bathroom with Bedroom 5 which is furnished with a King-size bed. 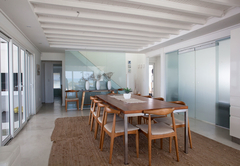 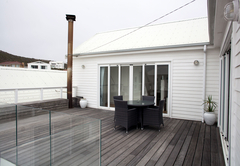 There is a large open plan area which opens out onto a wooden deck. 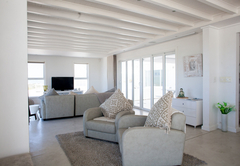 Meals can be prepared in the well equipped kitchen and enjoyed at the large indoor dining table or at the outdoor area where braai facilities are provided. 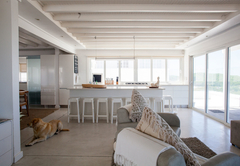 There is also a separate scullery area and a pantry. 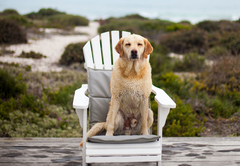 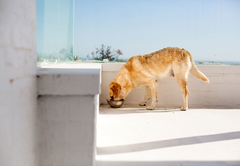 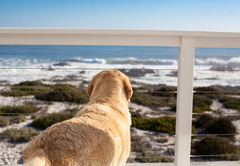 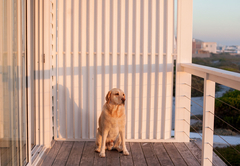 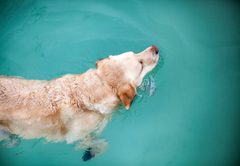 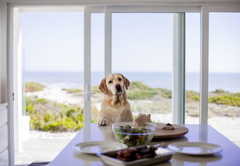 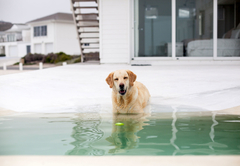 All house trained and well behaved pets are welcome at White Sands. 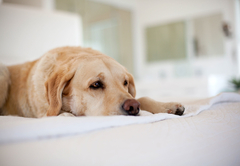 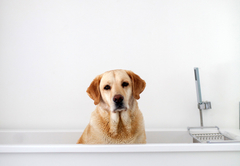 Owners are responsible for cleaning up after pets. 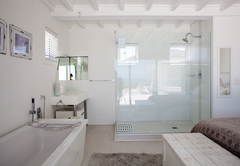 The self catering house has five bedrooms. 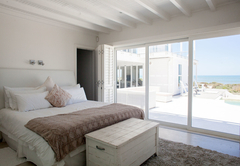 The large main bedroom has a King-size bed, wooden floors, a private lounge with TV, a deck overlooking the sea and an open bathroom. 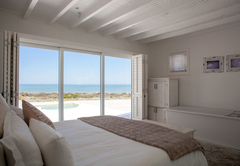 The second and third bedrooms are also furnished with a King-size bed and have a full en-suite bathroom. 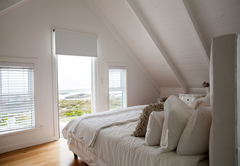 A smaller fourth bedroom has two double bunk beds as well as two extra pull out beds, making it ideal for the kids and their friends. 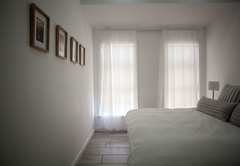 This room shares a full bathroom with Bedroom 5 which is furnished with a King-size bed. 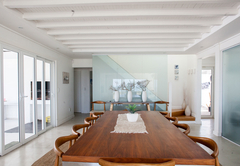 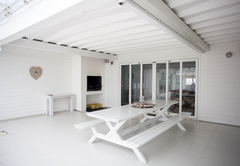 There is a large open plan area which opens out onto a wooden deck. 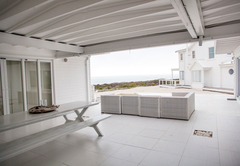 Meals can be prepared in the well equipped kitchen and enjoyed at the large indoor dining table or at the outdoor area where braai facilities are provided. 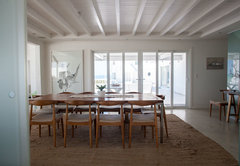 There is also a separate scullery area and a pantry. 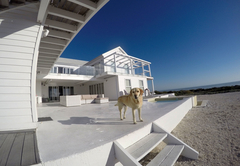 Response timeWhite Sands typically responds to requests in 5-10 minutes.